Because of my own interest in the topic, I was was thrilled to see an article by Ruth (Myers) Dourte in the most recent issue of In Part, the magazine of the Brethren in Christ Church in the U.S. Dourte and her husband, Eber, were two of the most important sources of oral history for my master’s thesis, “Born-Again Brethren.” Over 90 years old now, they lived through (and contributed to!) some of the most pivotal years in recent Brethren in Christ history — especially the years, in the mid-twentieth century, when the Brethren in Christ became increasingly invested in the larger Evangelical movement. Plus, Eber and Ruth are also fantastically hospitable and friendly folks! In 1943, my husband, Eber, became pastor at Hollowell BIC, a little one-room country church near Waynesboro, Pa. When we arrived, the church had 11 members and about 35 in attendance at Sunday School. The church began to grow as a result of revival meetings, and we saw many people “go to the altar,” declaring their allegiance to Jesus. Up until then, Grace Woglemuth—the wife of our district’s bishop—and I had been sewing cape dresses and making pleated head coverings for the women in the church. But now, with so many converts, we could not possibly keep up. 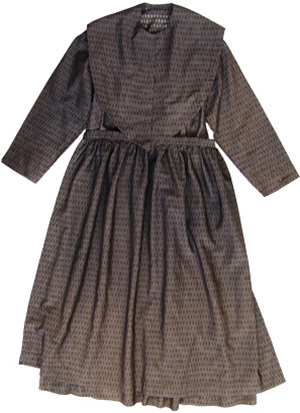 As a result, we began to wear modest dresses, without capes. This decision generated distress among some. Two deacons pled [sic] with me to reconsider, and my own father was so stricken by this change that he stopped coming to church for a time. But even more surprising and heartening was the response of one woman in the church, who told me that she and others began to feel like they could be up “on my level now.” While I had always thought that plain dress spelled humility, my neighbors had interpreted it as a sign of righteousness that seemed unattainable. By 1957, the Hollowell Church had 85 members, and attendance averaged over 250. God revealed His presence and power in ways we cannot fathom! 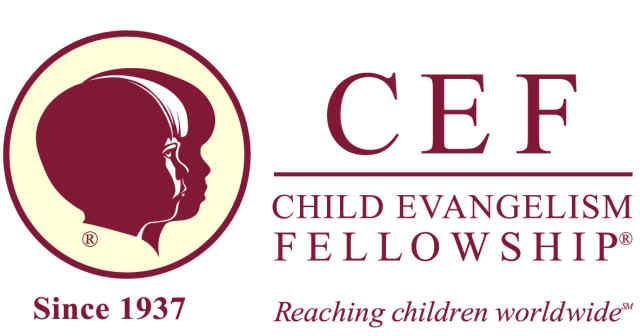 The logo for Child Evangelism Fellowship, an Evangelical para-church ministry founded in the 1930s. The Dourtes adopted the techniques of this organization and, as a result, saw attendance at their church increase. As you can see, in this piece Dourte attributes her decision to discard plain dress to “revival meetings” and the growing number of converts drawn to the church by these events. However, in research I did for my master’s thesis, Dourte described how revival meetings were only one mechanism that drew new converts to the church. She also claimed that Evangelical para-church ministries — such as Child Evangelism Fellowship — proved key to the church’s growth… and, as a result, to her decision to abandon plain dress. was the picture of a gracious, modest, loving lady. Her Bible studies were a huge ministry among the women. She sometimes shared in church, although she may never have given a sermon. Her love for others, her kindness, and her knowledge were an inspiration to us all. I don’t know the statistics, but Eber Dourte’s ministry must have been one of the high points of the Upland BIC Church.